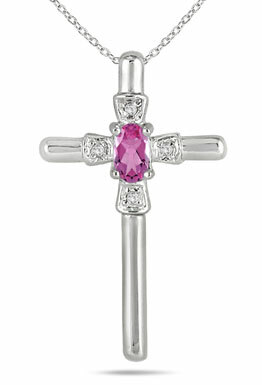 This gold cross stands at attention with outstretched arms and a precious gemstone cradled tightly at its center. The Oval-Shaped Pink Sapphire and Diamond Cross Pendant in 10K White Gold is a beautiful way to wear one's faith close to one's heart in the utmost elegance. This pendant features a glimmering pink sapphire (measuring 5 x 3 mm, 0.25 ct.) in a multi-faceted, oval cut that simply brings out the best in the stone. On the top, bottom, and sides of the sapphire sit four round-cut white diamonds (0.02 t.c.w.) that dazzle in the light and add to the allure of the pink sapphire. The pendant itself is cast in 10K white gold and polished to a beautiful finish that accentuates its rounded edges. This engaging piece of jewelry is the perfect way to celebrate the Holy Spirit and to have a daily reminder of one's faith and wondrous beliefs. We guarantee our Oval-Shaped Pink Sapphire and Diamond Cross Pendant in 10K White Gold to be high quality, authentic jewelry, as described above.